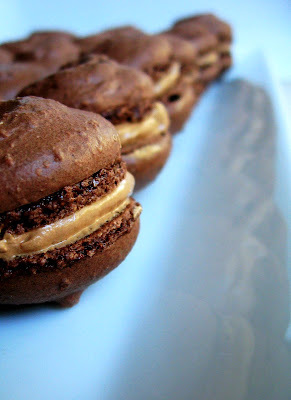 I've heard about Macarons for while but haven't really ventured out to buy one or make some. 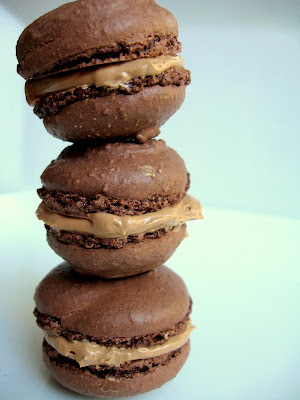 Thanks to the lovely miss Hannah, who forwarded me a website address that led me to do some searches on macarons (aka macaroons), I came upon this site by a man named David Lebovitz and his blog about chocolate macarons. Gave them a try and it turned out... ok for my first try. The batter was super bumpy both times I made it even though I pulverized the almonds as much as I could. 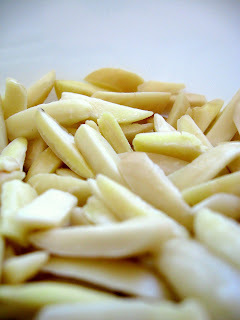 I also found a Martha Stewart recipe that I might give a go this week. Anyway, here is a rough visual of the process. 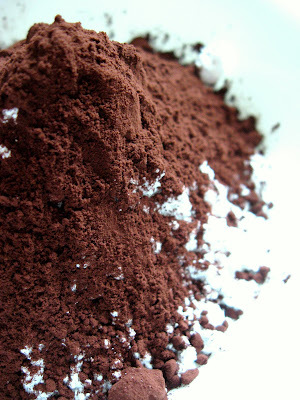 In a food processor add the cocoa powder, powdered sugar, and almonds. 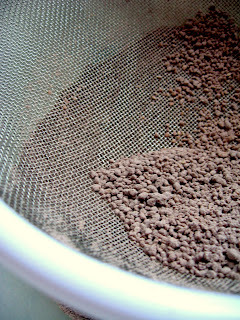 Even after a while in the food processor I still had some big chunks. 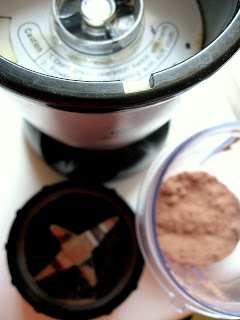 So, I poured the remains into this small blender used for smoothie drinks to pulverize the rest. Next time, I'll just buy almond flour. Next, is to make the meringue with the egg whites and sugar. It should stick up straight into the sky like this and have a super glossy coating. 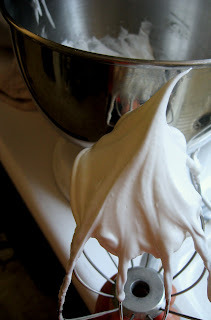 In a bowl, slowly add the dry into the meringue. 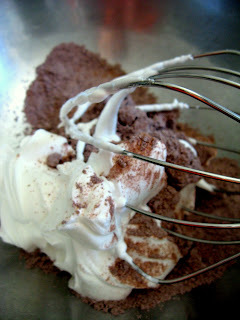 The picture has a whisk, but a spatula will work the best. I was really careful not to overmix because David Lebovitz was talking about how fragile the batter is.. but my batter was extremely stiff and didn't have that nice smooth top. So... the next time, I'll be really rough with it. 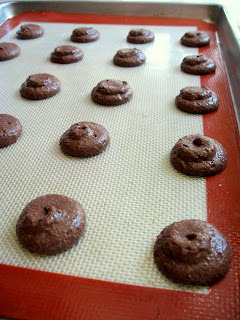 Use a round piping tip on parchment paper or a silpat. 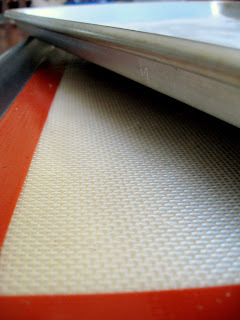 Silpat worked the best. KEY - Rap the sheet pan a few times really hard to settle the batter. I used a swiss buttercream recipe and added some Trablit (a coffee extract) and melted chocolate for the filling. It was quite yummy. People said it tasted like brownies. My brother said that these looked like the Mini Sirloin Burgers that Jack in the Box has. 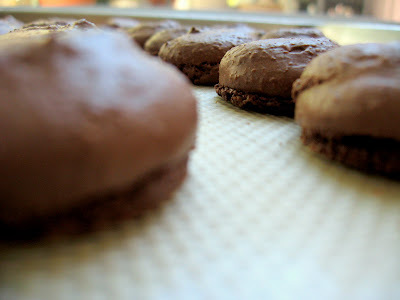 "Yippie ay yay, mini chocolate macarons! Hiyah!" nadia your photos are awesome. you must teach me. I have a Canon Powershot A570IS. Time for an upgrade though..